A man who stabbed another man in the back at his tower block home has been jailed for 10 years for manslaughter. Robert Fisher, 31, previously admitted killing William Floyd, 57, in Stevenage, Hertfordshire. 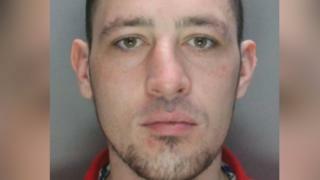 Fisher, of Hitchin, stabbed Mr Floyd, whom he knew, after they became involved in an argument on 6 March. His body was found six days later. The defendant, who lived in Nightingale Road, was sentenced at Luton Crown Court earlier. At a previous hearing, the court heard Mr Floyd had placed knives around his home because he was "frightened of attacks". Following the sentencing Det Sgt Jo Goodson, from Bedfordshire Police, said Fisher had never explained exactly why he decided to stab Mr Floyd. "This has left his grieving family with many unanswered questions," she said.